After a not-so-quiet 22 months, security startup Illumio plans to come out of stealth and detail how its technology works on Wednesday. Illumio’s take on securing the data center as well as cloud infrastructure makes for something more than providing a modern-day firewall for the cloud, said Andrew Rubin, Illumio’s CEO and founder. The startup’s security technology is like an access management tool for enterprise workloads. Whereas a startup like Conjur provides access management for companies with a lot of cloud infrastructure so that users can make sure that only the right person can get to a particular server or directory, Illumio applies that same idea to individual workloads; users can run Illumio to ensure that the right workloads only get transmitted to the appropriate servers. Users can load up software agents called virtual enforcement nodes onto their server’s operating systems — whether they are on the public or private cloud or on bare-metal machines — so that the agents essentially cover all workloads sent to and from those servers, explained Rubin. 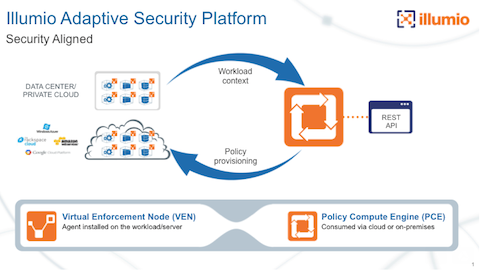 These agents receive their protection duties from a policy compute engine that users can setup with how they they want the workloads to be delivered. If at any point users need to spin up more servers, the policy compute engine can scale accordingly and allocate the appropriate workloads to the new servers. This type of workload security system can help ensure that an application running in a developer environment never gets put on a production server. It also allows companies paranoid of moving to the cloud to set up security policy in their own environments so that the policy can be carried to public cloud infrastructure, said Rubin. 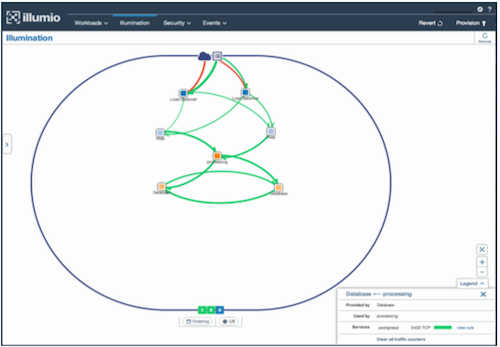 Part of the way Illumio developed its technology involved meeting and talking with companies about modern security issues they were seeing even before Illumio had a core product to showcase. “Despite being in stealth, we actually engaged with over a hundred enterprises,” said Alan Cohen, Illumio’s chief commercial officer. The startup counts [company]Morgan Stanley[/company], [company]Plantronics[/company] and [company]Yahoo[/company] among its customers and has raised $42.5 million from Andreessen Horowitz, General Catalyst, Formation 8, Data Collective, Marc Benioff and Jerry Yang. Post and thumbnail images courtesy of Shutterstock user LeventeGyori.